98.75% of text messages are opened via our SMS platform. It’s about 200% higher open rate than email marketing. Texting to your clients with the US and Canada phone number is always an ideal method to deliver your messages. With a few clicks, You bulk text messages will deliver to your potential customers, or your existing customers to let them know your promotions. You could always communicate with your customer through our elegant designed SMS online chat window and answer phone calls on the same window. Why Use Business Texting Platform. Get noticed & convert new sales SMS has a 200%+ higher response rate than phone calls and is 3x more efficient than email. It’s the perfect channel to promote services and new deals, invite users to download apps, deliver promotional coupons, and much more you could think of. Send a message at the right time to get more than 95% of text messages are read within 3 minutes of delivery, so sharing time-sensitive information with SMS will reduce no-show rates, increase sales conversions, verify appointment requests, receipts of payments, and more. Create meaningful customer conversations With 80% of customers wanting the option to text businesses, SMS is a great channel to engage users throughout the customer journey, powering meaningful conversations. See What Web Texting Platform Can Help? Can you imagine a successful business without a phone number? And can you imagine how important a business phone number nowadays? Business in multiple locations, so you must have a unified toll-free number for your customer always reach you! Web-based One-way and two-way texting chat window. Providing a local business phone number can make your customer feel safe because you are always around them. Not only for vanity but also always make your customer easier memorize you and your business can solve problems. Try it before buy it. We are always improving our service to serve our customer better in many ways! GET MY PHONE NUMBER NOW! Speedy, Global, Assured Delivery through our SMS Gateway Intelligent Routing Core. High-Quality Carrier grade intelligent routes Optimize speed, reliability and high SMS deliverability with direct connections with hundreds of carriers worldwide. Text messages will arrive in just seconds, anywhere in the world, through GenVoice Cloud communications platform. Our strict enterprise lever SLAs and industry-leading network infrastructure can always guarantee it. Always monitor the performance and open rate via our real-time dashboards. Seamless Two-Way SMS Enable conversations with interactive two-way SMS. Dedicated short codes with flat rates are supported for US and Canada. Intelligent Routing Core Ensure maximum efficiency and optimum delivery with our routing engine. Smart Encoding Detect Unicode characters like quotes and long dashes and replace them with similar GSM encoded characters, helping you to avoid sending two messages instead of one. Long Message & Character Support SMS messages longer than 160 characters are delivered as a single message to offer an enhanced customer experience. We support all modern and historic scripts. Branded Experience Use branded sender IDs to help your customers recognize – and trust – the sender. For your added security, you can access our service with SSL and VPN. Authenticate without hassle Enable user verification, transaction authentication & One-Time Password delivery to add an extra layer of security. 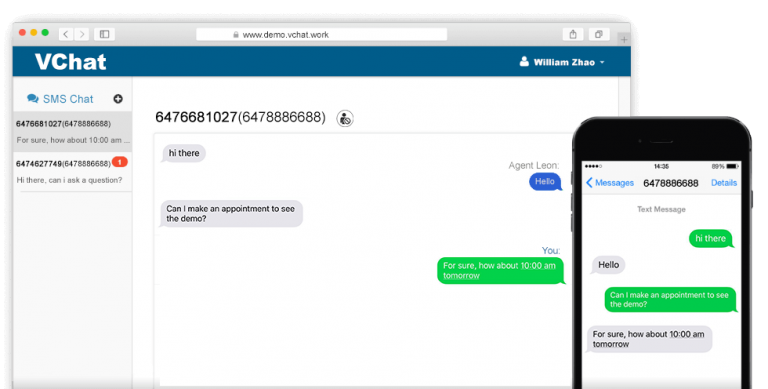 Our Simple And Robust SMS Messaging APIs Are Developer Ready. The most stable telecommunication network connect with virtually anyone worldwide via APIs. Your team can easily test and integrate them into any of your favorite business application without hassle. We won’t require your credit card information and we don’t even need you to register with us. Just try our service, if you like it, you pay only $9.99/month after the trial period. GET MY BUSINESS PHONE NUMBER TODAY! Can I Send A Text Message Over WiFi? Yes, the platform is 100% on the internet, so as long as you have an internet connection, you can send and receive the text message out. How Many Agents Can I Have For My Business? 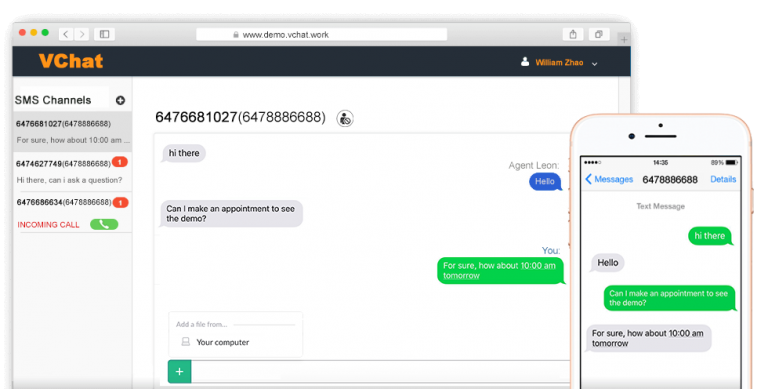 You Can have unlimited agents assigned to different groups to handle the different request. How Many Phone Number Can I Get? You could have unlimited phone numbers in your account. the purpose of using multiple phone numbers is if you have business in different areas, and the local customers can dial or texting the local phone number of your company. How Many Messages Can I Send A Day? You can send unlimited messages a day, please keep in mind, each message you send will cost you money. and don’t spam! It will cause your account being banned by our system. How to Using GenVoice API To Send Text Messages? Please refer to our SMS documentation, you could always contact us by email if you have any questions. Yes, you can send bulk messages to your clients, either for your marketing purpose or promotion purpose. GET THE PHONE NUMBER NOW! Don’t Worry, We Won’t Spam For Ever!